In the last segment, Bill and I discussed the timing of the Rapture and the United States in relation to what I call the "War of Extermination" based on Psalm 83, which we believe is the first end time war. In this segment, we look at the second end time war in the series — the First War of Gog-Magog. 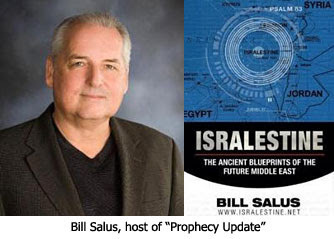 Bill Salus: Let's talk about the war that naturally would seem to follow the taking out of the inner circle of Arab nations around Israel in Psalm 83. It would appear then according to your article that Ezekiel 38 and 39 would be ripe to occur? You may remember that after World War II Russia invaded Iran and refused to remove their troops until after the end of World War II. President Truman called in their foreign minister for a meeting. When the meeting was finished the Russian minister came out and he was white as a sheet. He was asked, "What did the President say?" H replied, "All I can say to you is that I have never been talked to like that in my entire life." What Truman basically told Russia was, "You either get out of Iran or we'll drop a nuclear bomb on you." They withdrew their troops, but they still wanted Iran. Bill Salus: I give credit to Joel Rosenberg and Chuck Smith from Calvary Chapel and many of those people who are teaching pretty strongly about the Ezekiel 38 and 39 War. We are suggesting that perhaps this war is near, but it's not the next war. Bill Salus: A lot of good articles are being forwarded around that Russia and Iranian national relations have never been stronger. Russia is helping Iran with their nuclear program. We've also recently got Turkey, a member of the Ezekiel 38-39 coalition, contracted to get the S-400 missile defense system. And Libya, who is also involved, Russian recently contracted with Libya to develop a nuclear program of their own. Dr. Reagan: I think the things that are happening in Turkey are very important along this line, because the Turks have wanted so much to get into the European Union. The European Union is scared to death of them because they know that the moment they were to be added to the European Union they would have to allow free immigration into all of Western Europe and there would be a flood of Muslims into Western Europe, which they don't want. So, they have found every reason in the world to keep the Turks out. And, as they have done that, the Turks have become more and more upset. Turkey now has a very nationalistic leadership that is very Muslim-oriented and is basically saying they need to become a Muslim nation, which they already are, but they aren't in their government yet. Turkey is saying that they need to do that. What I think we are seeing is Turkey being forced to turn its attention away from the West and back towards the East, getting in bed with its natural allies. Dr. Reagan: It is an excellent book! The only weakness of it is that it was written before your book, and so Ron doesn't consider Psalm 83, but he certainly has a lot of good arguments in there. The book is about the timing of the Ezekiel 38 and 39 War. It asks when the war will be — "At the middle of the Tribulation? At the beginning of the Tribulation? Before the Tribulation?" He believes that it will occur about 3 1/2 years before the Tribulation starts. Dr. Reagan: Yes, I think there will be nuclear weapons that they will certainly bring with them. Whether they will use them or not I don't know, but they'll certainly bring them with them. The Bible in Ezekiel 38-39 talks about the Israelis using these weapons for seven years, burning them, and it could well be that it is talking about nuclear fuel. Dr. Reagan: Well, it doesn't say a whole lot because I think God is going to be using these wars. One of the purposes of these wars will be that God will use them to judge Islam. I think that when these two wars are over with, you are going to find Islam in total disarray in the Middle East, because all of the Islamic nations will have been defeated except for Saudi Arabia. I covet (in the Christian sense ;) your all's prayers for next week's conference. It's my first time speaking at a conference and I haven't quite nailed down what my style is yet. I'm coverning the Gog-Magog Battle. The other speakers have decades of experience on me. Thanks!